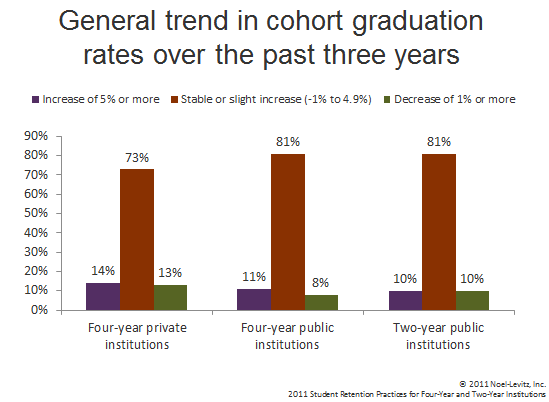 This table shows that approximately three-quarters of colleges and universities nationwide have seen stable or slightly increasing cohort graduation rates over the past three years, while the remaining institutions saw either an increase of at least five percent or a decline of one percent or greater. The data are drawn from Noel-Levitz’s forthcoming report, 2011 Student Retention Practices at Four-Year and Two-Year Institutions, based on a national survey conducted in May 2011. These findings are generally consistent with other national research studies which, overall, have shown stable completion rates nationally over the past several years, despite the widespread interest among many to significantly increase college degree attainment rates. What is keeping these rates from going up? When asked to identify their single-biggest retention challenge, respondents in the study identified: 1) underprepared or unmotivated students; and 2) a desire for greater collaboration and agreement among faculty, staff, and senior administration regarding retention concerns. A third area of challenge that was evident was the relatively low percentage of respondents (10 to 20 percent) who indicated they had a retention plan that they considered to be of “excellent” quality. Want to learn more? Watch for the new report on retention practices to be released in July 2011 under “Papers and research” at www.noellevitz.com. Also, consider attending the retention track sessions at our upcoming National Conference on Student Recruitment, Marketing and Retention July 26-28, 2011, in Denver, or join us this fall for a one-day workshop: Student Retention and Degree Completion: Identifying the Most Productive Strategies, coming to Houston on October 12, 2011, and to Indianapolis on November 15, 2011.